West Australian Production Sedan Champion, Barry Rose has won the traditional final event of the Make Smoking History Collie Speedway, the Bill Sibbald King of the Road. The race which remembers one of Collie Racing Drivers Associations most decorated drivers, saw a near capacity field face the starter, with former State Champion Drew Ogle and Kyle Sayer starting on the front row, with Rose and Victorian Champion Beau Riley on row two, multiple State and National Champion Jamie Oldfield and former State Super Sedan Champion Frank Does on row three, while former National Champion, Rod Musarra, would be on the fourth row, showing the calibre of the field. Kyle Sayer and Drew Ogle would have a great tussle early for the lead with Sayer getting the better of the exchange in a spectacular sight. Veteran Garry Sutton would be an early retiree, as Barry Rose started to make his presence felt, driving around the outside of Ogle to move to second on lap eight. Two laps later, he would pass Sayer to ascend to the lead, with Sayer staying with the State Champion for a few laps as the duo hit lapped traffic. Beau Riley moved to third as Ogle slowed and eventually retired which would elevate Jamie Oldfield to fourth at the half way mark. The yellow lights came on as Ogle was unable to get off the track due to the heavy traffic, with Rose catching lapped traffic again after the resumption within four laps. With just a few laps remaining, Kyle Sayer would be forced to retire, setting up a three lap restart, with Rose having to hold off Jamie Oldfield in the concluding stages. Rose proved too strong, holding off Oldfield and Riley, who were the only three drivers left on the lead lap, while Phil Lycholit and Riley Beaumont finished fourth and fifth respectively, one lap down, while Leticia Hamon finished sixth two laps adrift of the winner. Feature, 40 laps: 1. W13 Drew Ogle, 2. W95 Kyle Sayer, 3. WA1 Barry Rose, 4. W40 Beau Riley, 5. W51 Jamie Oldfield, 6. W3 Frank Does, 7. W12 Rod Musarra, 8. W41 Rickie Nuccini, 9. W71 Jake Blight, 10. W86 Wayne Leviston, 11. W92 Ricky Williams, 12. W7 Leticia Hamon, 13. W20 Graeme Riley, 14. W199 Phil Lycholit, 15. W18 Garry Sutton, 16. W87 Riley Beaumont, 17. W42 Bev Brewer, 18. W113 Shane Dubberlin, 19. W26 Rob Trenaman. 1. WA1 Barry Rose, 2. W51 Jamie Oldfield, 3. W40 Beau Riley, 4. W199 Phil Lycholit (39), 5. W87 Riley Beaumont (39), 6. W7 Leticia Hamon (38), 7. W92 Ricky Williams (38), 8. W20 Graeme Riley (38), 9. W26 Robbie Trenaman (36). DNF: W95 Kyle Sayer (38), W12 Rod Musarra (38), W42 Bev Brewer (33), W3 Frank Does (35), W41 Rickie Nuccini (32), W71 Jake Blight (24), W13 Drew Ogle (18), W86 Wayne Leviston (15), W18 Garry Sutton (4). DNS: W113 Shane Dubberlin. Total Time: 1.047. 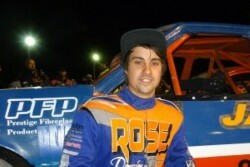 Fastest Lap: 20.746 WA1 Barry Rose.